Going to AOM? Come to this caucus! In a rapidly-changing, digitally-connected world do Academy of Management members face new ethics issues as academics, professionals, students? To what extent does the Academy of Management Code of Ethics provide guidance for ethical actions? Global membership: Nearly half of the 18K plus AOM members are from countries outside North America. Scholar-Practitioners in Management and Consulting Professions: AOM is attracting more professionals who are not full-time academics. Communication and Data in the Digital Age: Privacy issues in academic and professional life are increasing, given access to online data and access to social media. Scholar as Role Model: Whether teaching online or in the classroom, or supervising research, academics face ethical dilemmas. Publication Process:Ethical dilemmas abound from the perspectives of editors, peer reviewers and writers. The AOM Ethics Education Committee will collect and review small group discussion notes to determine needs for new directions and recommendations to the Academy. 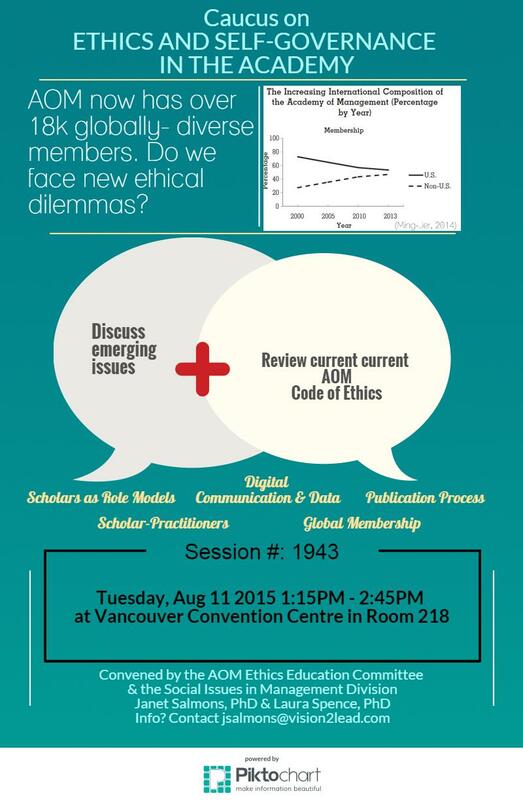 The Caucus is convened by the AOM Ethics Education Committee and the Social Issues in Management Division. Laura Spence and Jill Brown join me as co-organizers.